Dining Chairs: 22 Inches Wide, 22 Inches Deep, 36 Inches High. Dining Table: 29 Inches High, 36 Inches Wide, 54 Inches Deep. The Chesapeake Bay rattan dining set makes efficient us of your space yet still seats 6. -This rattan dining set is stylish, comfortable and made in the USA! 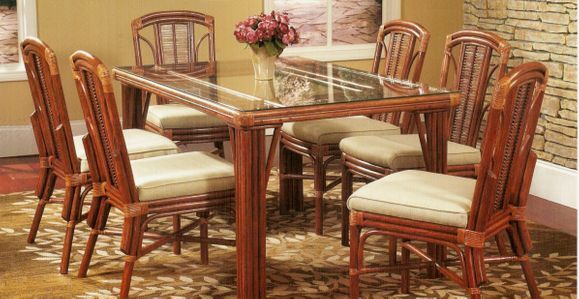 -A 7 piece rattan dining set that is sized to fit most dining areas.